“We colored people can’t organize without you and you white folks can’t organize without us. Aren’t we all brothers and ain’t God the Father of us all? We live under the same sun, eat the same food, wear the same kind of clothing, work on the same land, raise the same crop for the same landlord who oppresses and cheats us both. For a long time now the white folks and the colored folks have been fighting each other and both of us has been getting whipped all the time. We don’t have nothing against one another, but we got plenty against the landlord. The same chain that holds my people holds your people too. If we’re chained together on the outside we ought to stay chained together in the union. It won’t do no good for us to divide because there’s where the trouble had been all the time. The landlord is always betwixt us, beatin’ us, starvin’ us and makin’ us fight each other. There ain’t but one way for us to get him where he can’t help himself and that’s for us to get together and stay together.” Isaac Shaw, sharecropper, 1934 (Kester, 1969). The Southern Tenant Farmers’ Union (STFU) was founded in Arkansas in 1934 by a group of socialism-inspired sharecroppers. The STFU was notably an interracial and gender-inclusive organization. 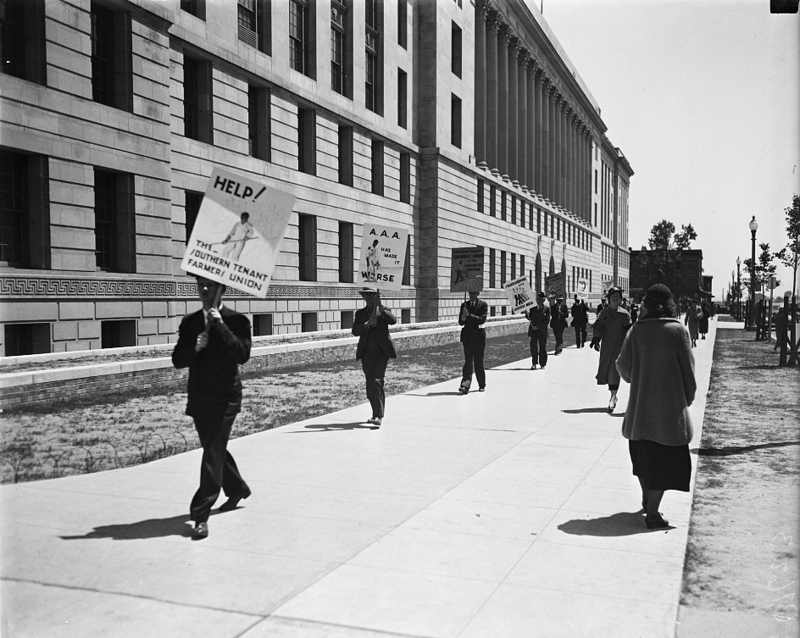 They sought relief from the federal government for populations neglected by the New Deal’s agricultural policies, such as sharecroppers and tenant farmers (George Washington University, n.d.). Under the New Deal’s Agricultural Adjustment Administration (AAA), tenant farmers and sharecroppers were legally owed their share of profits from the crops they grew; however, there was little enforcement, and landowners often demoted their farmers or evicted them in lieu of paying them (Payne, 1998). As described by Grubbs (1971), this relationship between landowners and tenants comprised a new type of slavery. Likewise, Kester (1969) states that the southern sharecroppers working on cotton fields were the most exploited agricultural workers in the history of America. As the Depression worsened, the Southern Tenant Farmers’ Union grew, organizing strikes to increase daily wages and sending delegates to lobby in Washington, D.C. By 1936, the STFU had more than 25,000 members throughout several southern states (George Washington University, n.d.). Their political presence and Dorothea Lange’s photography introduced the nation to both the plight and resilience of sharecroppers. Artist involvement with the STFU helped to cement the belief that the cultural and artistic heart of democracy resides in the lives of ordinary citizens. Thus, sharecroppers became symbols of American strength (Payne, 1998). As enrollment in the STFU increased, so did landowners’ mistreatment of their tenants, with both sides resorting to violence. However, little was done to help the tenants until Rexford Tugwell, an economist, brought the conflict to President Franklin D. Roosevelt’s attention in 1935, resulting in Roosevelt’s Resettlement Administration (RA). The RA sought to improve cultivation techniques and resettle destitute farmers; unfortunately, many of the RA’s programs were designed to have long term benefits, and thus did little to mitigate the circumstances of the time (George Washington University, n.d.). National recognition, including support from Eleanor Roosevelt, grew for the union after a successful strike in August 1935, during which thousands of members organized against their planter landlords. While the landlords initially retaliated with violence, they ultimately agreed to a 0.75 cent increase in wages as picking season loomed (George Washington University, n.d.). 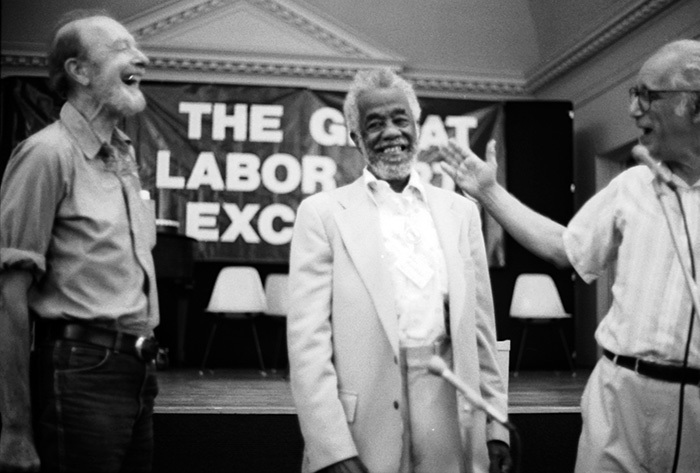 Pete Seeger (left) and Joe Glazer (right) give John Handcox the Joe Hill Award, 1987. Photo by Larry Rubin. Myrtle Lawrence, a sharecropper and later labor organizer, joined the STFU in 1936, when labor meetings’ fiery sermons and emotional hymns more resembled a southern evangelical revival than a typical labor organization. The heavy influence of the Baptist Church helped to bond men, women, and children, both black and white, in protest. By 1937, Lawrence was regarded as the best organizer of African Americans in the STFU, but was often excluded from political venues due to being labeled as “not respectable” for her public spitting and exuberant personality. However, her charisma attracted Louise Boyle, an American photographer famous for her Depression Era photography, who lived with Lawrence and documented the continued struggles of the sharecroppers (Payne, 1998). Likewise, John Handcox, a tenant farmer, embraced the STFU, having witnessed first-hand the injustices inherent to the life of a sharecropper. Handcox began to compose songs and poems to be sung at STFU meetings to boost morale. Then, in 1937, Handcox recorded his music at the Library of Congress, generating significant notoriety for Handcox and his work . These songs became standards and were covered by Pete Seeger and Woody Guthrie (West Virginia University Press, n.d.). Regardless, violence continued, so congress created the Farm Security Administration (FSA) in 1936. Through the FSA, the Farm Security Corporation was created, which gave loans to poor families to help them to buy their own land. 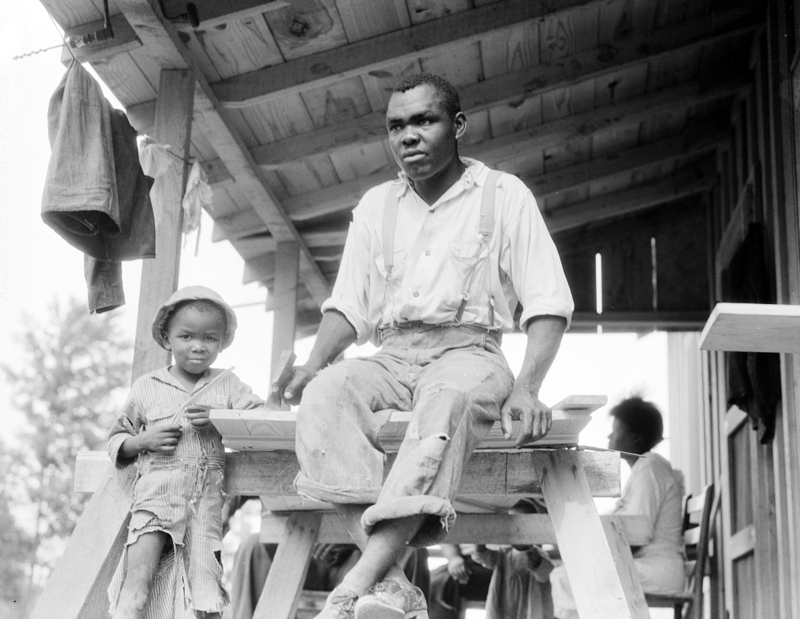 Overall, the FSA did little to alleviate the sharecropper’s plight, and with few successes after the 1935 strike, the STFU faded from importance by World War II (George Washington University, n.d.). This work may also be viewed through Vimeo. Grubbs, D. H. (1971). Cry from the cotton: The Southern Tenant Farmers’ Union and the New Deal. Chapel Hill, NC: University of North Carolina Press. Kester, H. (1969). Revolt among sharecroppers. New York, NY: Arno Press. Manthorne, J. (2010). The view from the cotton: Reconsidering the Southern Tenant Farmers’ Union. Agricultural History, 84(1). Payne, E. A. (1998). The lady was a sharecropper: Myrtle Lawrence and the Southern Tenant Farmers’ Union. Southern Cultures, 4(2).